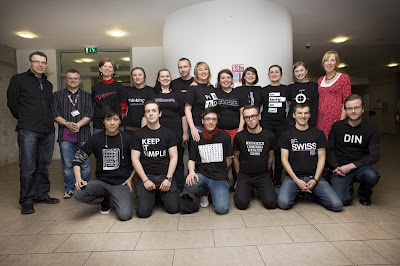 On Wednesday night the Design Team held its end-of-year Review in the Hub. The event, the first of its kind, was conceived and planned by lecturer Helena Good, and featured a selection of print work by both HND Year 2 and Year 1, covering the past 15 weeks of their respective courses. 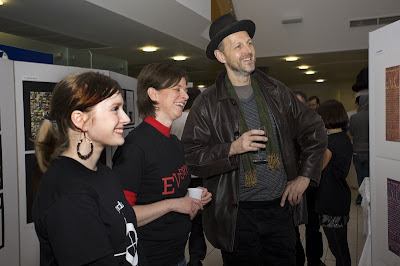 Also on display was a video installation of Year 1 work, and a digital presentation of NC print work. 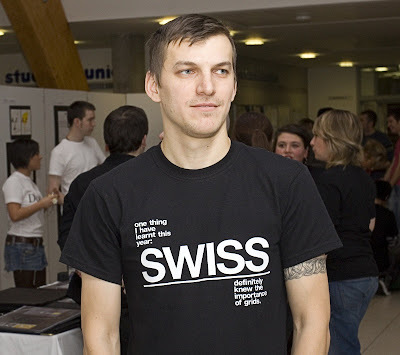 Students from all three years designed their own t-shirts for the event, using a word or phrase that related to their learning. The evening was a great opportunity for them to relax a little bit, let others look at their work, and reflect on their progress so far. As well as Department Head Jeff Brown, a number of the Mentors were in attendance, along with a good selection of our former students, who were all clearly impressed by the work our current crop of students are producing. Santa also made an unlikely appearance and assisted Helena in handing out Secret Santa presents to the 1st and 2nd years. The next event of this kind will be the Year 2 Industry night, hopefully taking place in the middle of next Semester. The YCN Annual is a showcase of emerging creative talent, featuring work submitted by designers for specially commissioned briefs durign the previosu 12 months. 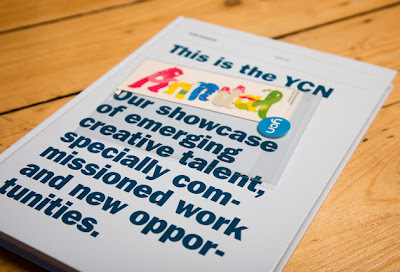 With a new name and format - and a customisable cover - YCN have set out to include as much original and specially commissioned work as possible. As ever, the publication marks the launch of the annual YCN Student Awards; presenting 20 new live creative challenges - from the likes of Google, Castrol, Cartoon Network and VisitScotland - a selection of which we will be handiong out as class projects next semester. A dedicated chapter also celebrates all those commended as part of last year's programme, including two of our former students (see my recent post about them). D&AD's Yellow Pencils are recognised the world over as a symbol of true creative achievement. 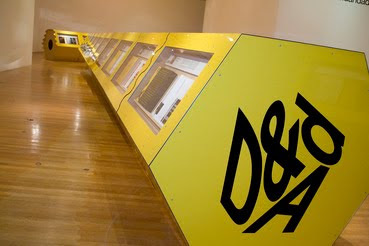 D&AD has celebrated and nurtured outstanding work in design and advertising since 1962. Each year, the D&AD Annual Showcase provides an unrivalled source of creative inspiration and is a great guideline as to current trends, skills and style in contemporary visual communication. Its also a good indicator of the sort of designers that Further and Higher Education is producing. So this year, with Edinburgh's Telford College now fully joined up to the University Network programme, we'll be looking to encourage our HND students to submit work based on the 2010 briefs. The D&AD University Network Programme has been running now for more than twenty years, and being a member helps an institution to establish relationships with leading creative practitioners and agencies, provides teaching packs and resources incorporating the best examples of creative practice and execution and adds live industry focused elements to the curriculum. Membership is aimed at all Higher Education courses teaching creativity including Advertising, Graphic Design, Digital Media, Film & Animation, Photography, Illustration. One thing I am excited about this year is that D&AD are revamping their web presence to include an online showcase of each institution's entries, which should give our submissions a great deal of exposure to the right sort of audience. 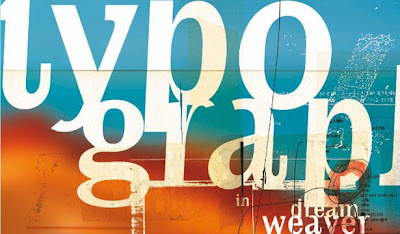 With more print-based designers now delivering for the web, one consequence has been a huge amount of interest in web typography. What's true for print holds true for the web - the way in which typography is controlled and presented can dramatically improve or hinder the reader. And of course when it comes to the web, maintaining the users' interest (and site visiting time) is crucial. More print-based ideas and techniques are transferring from page to screen, and a lot of it is down to CSS and standardisation across the major browsers. CSS now provides us with styles to mimic print techniques such as kerning, tracking, leading, justification, drop-caps and so on. 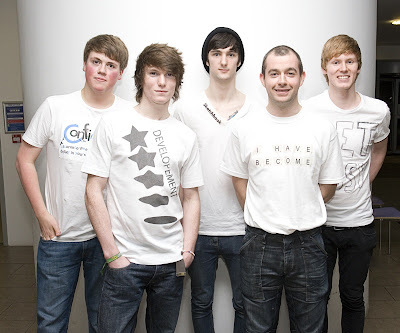 HND2 are now well into their Web Unit, and one area that we will look at in detail is typography for the web. As well as an unlimited supply of great online exercises and examples, there are some useful articles on the web, many written by successful designers and aimed at everyone from novices to experts. Noupe.com - Contrast, Techniques and Best Practice. 3point7designs - 10 Examples of Beautiful CSS Typography and How They Did It. 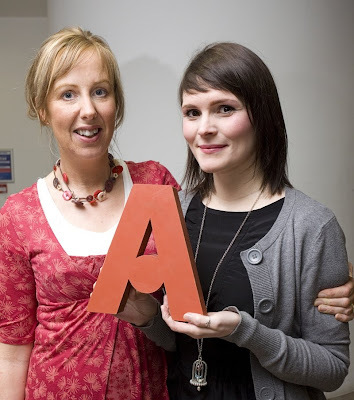 Aisleone.net - 8 simple ways to improve web typography.